You can’t mistake that freshly baked cinnamon scent at The Grange this month. Our delicately spiced and sugar-glazed hot cross buns are the perfect accompaniment to a cup of tea or freshly brewed coffee. Lightly toasted with a golden glow, these fruity buns are glossy on the outside, while soft, doughy and fruit-laden inside, just waiting to be devoured alone or with butter and jam. 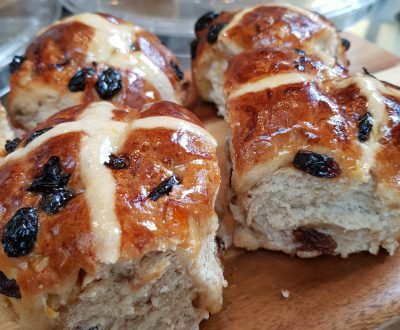 Come and relax at The Grange with a freshly baked hot cross bun, available throughout the Easter holidays until 20 April for just £2.80. Please remember, we will be closed on Easter Sunday and Easter Monday (21-22 April) to let our volunteers and staff spend a little time with their families.